Pricing: Pricing includes up to four colors of enamel and up to four silkscreen colors, and military (butterfly) clutch. 4 weeks after art approval . Synthetic Stones: .98 (A). Many Colors available. Color poly with silk-screening combines the elegance of enamel resin colors with silk-screen overlay. You may also hear this process termed as "laser enamel" or "print on enamel." Silk-screening on color poly allows colors to be added to your pin in areas too small for enamel, without separation using metal walls. 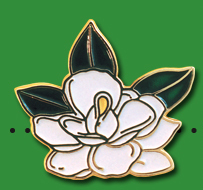 An invisible coating of clear lacquer will be applied to the surface of your pin to protect the silk-screen colors. 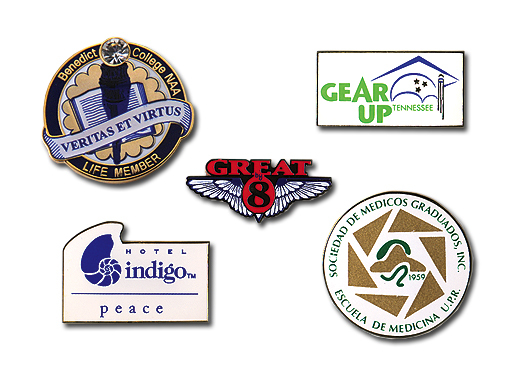 Both color poly enamel and silk-screen colors can be matched to your PMS requirements.